Montreal is one of those rare cities that rules all seasons. It has no siesta or hibernation mode, keeping its citizens and visitors just as entertained in high summer as it does in the dead of winter. This explains why – on a recent whirlwind trip to the 376-year-old city – I found no shortage of interesting, delicious and otherwise awesome things to do. 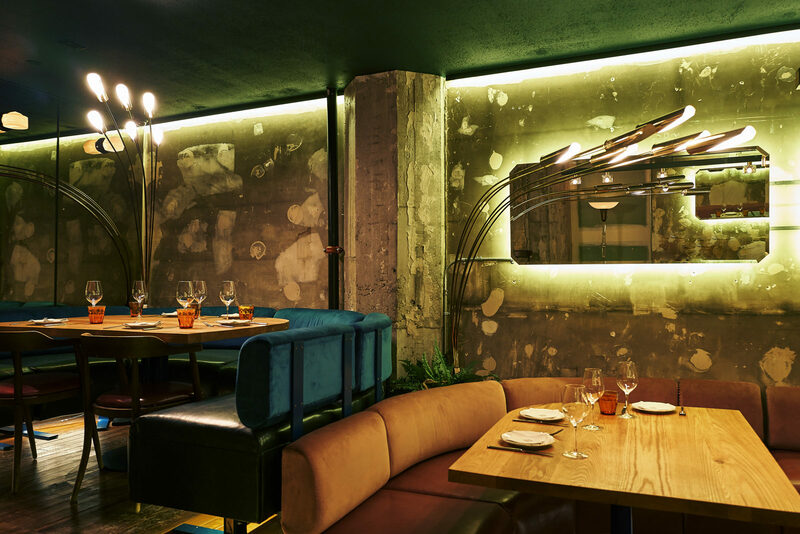 The attraction – for me at least – starts with Montreal’s restaurant scene, which was operating on a high level well before my home town of Vancouver was even born. Its depth and breadth can be pretty daunting for travellers looking to cut a sampling swathe through it, but have courage and let’s give it a good try. First there are legendary mainstays that run the representative gamut. And patios be damned. I’m talking about the essentials cold weather spots, of which there are a ridiculous assortment: Schwartz’s Deli, where all dreams of Montreal smoked meat originate; pioneering Restaurant Toqué!, which arguably offers the finest plated iterations of farm-fresh Quebecois cuisine (incidentally, this is where Vancouver chefs / restaurateurs Angus An and JC Poirier got their starts); Au Pied du Cochon, the carnivore’s temple to off-cuts and guiltless good times (see also the venerable, equally excessive Joe Beef); humble diner Chez Claudette for characters and classic poutine; St. Viateur, the iconic neighbourhood bagel shop; Dieu du Ciel and Bistro-Brasserie Les Soeurs Grises for delicious craft beer; and the list goes on. But if you set all that well established awesomeness aside for a moment to consider how eating and drinking in Montreal isn’t just about hitting up the usual suspects, you’re setting yourself up for rich rewards. Want to feast on amazing Syrian share plates? Bring your friends and your appetites to Damas in Outrement. Seeking entrée into the deliciously unique flavour realm of Ethiopia? Hit chic Nil Bleu on St. Denis. Craving Russian dumplings and looking to satisfy a medieval dungeon fetish? Check out La Caverne in Côte-des-Neiges. Winter in Montreal has every rib-sticking thing you could hope for. And like most great food cities, it is in a constant state of flux, evolving and diversifying with every new restaurant opening so that just when you think you’ve got it figured out it changes on you, and always for the better. I was also able to check out Le Blumenthal – still in its first year – which overlooks the Place de Festivals. I was attending a special dinner that had chef Rémi Brunelle temporarily surrendering his kitchen to imported Provençal talents Jessica Gilly and Vincent Bezy. The two culinary teachers from the Brise-lames vocational school in Martigues were in town to deliciously showcase ways of cutting down on food waste, thoughtfully drafting and exquisitely executing a tasting menu that took a nose-to-tail, root-to-leaf approach to every facet of each dish. It was just my luck that it was going down during the 19th annual Montréal en Lumière festival, which saw many thousands of well-bundled locals and tourists braving zip-lines, light shows, ice slides, ferris wheels, circus performers, live music, gastronomic indulgences (anchored by local maple syrup, bien sûr) and sub-zero temperatures right outside the soaring picture windows. For morning coffee and afternoon re-ups I was absolutely smitten by Crew Collective, a cafe and co-working space spread out on the bewitchingly beautiful, cathedral-like main floor of the 1920’s Royal Bank building in old Montreal. The sprawling space offers open wifi, online ordering and meeting rooms that are bookable by the hour. (For members, there’s a secured/shared workspace that can accommodate about 70 people). For walkabout grab-and-go brews, the Saint-Laurent location of local roaster Dispatch sits among the many massive public artworks still on display in the wake of the city’s colourful Mural Festival, so it’s a great jumping off point to explore the eclectic borough, which is like Canada mirrored in microcosm (reportedly home to some 166 different ethnicities). Bonus: it’s conveniently just down the block from Schwartz’s, just in case you need another dose of the good stuff. I stayed at the Hôtel Bonaventure (that striking exemplar of brutalist architecture), which was so ideally situated that I gladly walked in the cold – hot cup in hand – to and from some special exhibitions between meals. Chief among these was the comprehensive Leonard Cohen celebration at the Musée d’Art Contemporain de Montréal. This was a real education for me. I entered a fair-weather fan of the city’s late favourite son and left with not only a much greater appreciation of the polymath’s extensive body of work but also of Cohen’s tremendous impact on his fellow Montrealers. Of the many installations that stood out, I was especially mesmerized by the 1950s Wurlitzer organ, dubbed The Poetry Machine. Conceived by British Columbian artists Janet Cardiff and George Bures Miller, its keys were programmed to play lines from Leonard Cohen’s most famous works. Museum-goers took turns sitting at it – flanked by a veritable wall of vintage speakers and gramophone horns – to play out their own spoken word requiems. Pure magic. Just as impressive was Napoleon – Art and life in the Imperial Palace, the vast exhibit currently installed in the cavernous halls of the Montréal Museum of Fine Arts. From the fashions and furnishings of the various royal households to the related oil paintings, classically-inspired sculptures and opulent tapestries littering the floors and walls of the museum’s massive, interconnecting rooms, it was a rewarding thing to take in. Though a bit of a Napoleon wonk (he’s a short guy, I’m a short guy), the old front-of-house guy in me appreciated the intricate dinner service set-up most of all, elements of which (plateware, silverware, etc.) were as beautifully crafted as they were immediately familiar and functional. This I did until it got dark and followed it up with the discombobulating AURA light show inside the Notre Dame Basilica on Saint Sulpice Street. As a punctuation point, it was a pretty transportive experience, like seeing a glimpse into a sonic parallel universe in which Roger Waters of Pink Floyd had gone on a catholic tangent. Or something like that. It was far too big for me to fully comprehend and take in, but it was no less captivating and enjoyable in the moment, and I really didn’t want it to end — much like my time in Montreal. The Eastern Townships of Quebec are just a couple of hours away from Montreal and are worthy of a couple of days’ exploration. My side trip was centred around snowy Mont-Orford National Park, where I was glad to get back into nature and hike the birch forest in sharp crampons, and the town of Magog, where I warmed up with duck wings, more poutine and a deep selection of craft beer at Microbrasserie La Memphré. I’d previously been privy to the joys of Quebec cider (on this trip I sat and sipped plenty at Union Libre) but had never – at least in conscious memory – accepted a glass of Quebec wine, so I was stirred by the unfamiliar tastes of Frontenac and Vidal offered at Vignoble de l’Orpailleur. If you are lucky enough to head this way in winter, feast and rest your head at Estrimont Suites & Spa, dig the hospitality and indoor pool at Auberge West Brome, and take advantage of the incredible spa facilities at Balnea (world class, especially the outdoor tubs). Also, give fat-biking and kick-sledding a try at Vie de Plein Air (both are chilly thrills) and restore yourself with hot mocha at Bromont’s charming little chocolate museum. This trip was facilitated with the assistance of Quebec Original, Tourism Montreal and Tourism Eastern Townships, for which I am eternally grateful. Many thanks to Danny Pavlopoulos of Spade & Palacio for the tour and the local wisdom, and to @scoutmagazine followers for their guidance in a pinch. Oh Montreal, how I miss you. Having spent a couple years in Montreal, to discover my deli roots, I worked at Schwartz, and a couple other delis. I have always thought that Montreal is the best city in Canada, although I believe that Vancouver is the best city to live in. Nice job reminding us of some old classics, and finding some new places too. If you get a chance Bourdains visit to Montreal is a classic. For readers of crime, the Gamache series by Louise Penny is set primarily in the Eastern Townships. And this week, she has announced tours based on some of the locations in her books. This is a really great article and resource, I’m looking forward to visiting and trying your recommendations. Put Bouillon Bilk at the top of your list of Montréal Must-Dine-Ats. Consistently great food with attentive, but not intrusive service. More recently have been doing the full tasting menu and have yet to hit a dud dish. Dining at Joe Beef this trip, hope it stands up to the hype. For an interesting cocktail experience, check out Cloakroom Bar. Finding it is a bit of a challenge, but once you’re inside it’s a cool little pocket bar that makes every drink to your preferences – no list of cocktails to choose from and the classics are reinterpreted. Fun spot!